, I had to read about the magic of tidying up. Amy and I had just gotten rid of over 100 books in December, (some completely unread) and while I was hesitant, I ended up purchasing the book via Kindle. The first major (unrelated) observation I made was that I easily finished this book in a few evening reading sessions. I’ve previously found it difficult to read a book all the way through due to the number of unread books on my bookshelf asking for my attention. Reducing the number of ‘obligations’ that I had on my bookshelf allowed me to relax and focus on the one book I was reading. I will not buy or acquire a new book until I’ve fully read or given up ownership of the book acquired before it. I expect that this rule should do exactly what it needs to for me, but I’ll keep you posted. Back to the book though. Overall, I agree with the consensus that this is a fantastic book to read if you’re looking for an effective strategy of streamlining your possessions. It completely changed the way that I think about the things that I own, and changed my method of discarding unwanted items. Most of us go through our homes looking for things to discard, in order to declutter the space. The author, Marie Kondo, suggests that this style of thinking is backwards. She suggests that you should organize by category instead, bringing all of the things of a particular type into the same room with you. Hold each one and ask yourself, “Does this spark joy in my heart?” and if it does, you should keep it. Marie believes that you should choose the things you want to keep, and get rid of all the rest. I did find that this thinking made it even easier for me to decide what to discard. In fact, it has completely changed the way I think about my clothing—which was another point she made in the book. As an example, our clothing takes care of us all day by protecting us from the sun, keeping us warm, dry or comfortable. We then often throw it on the floor, or let it pile up for weeks avoiding doing laundry. After reading this book, I started taking a completely different approach to laundry. I had donated all of the clothes that I don’t absolutely love, so I no longer resented having to take time cleaning and properly folding those items. It became incredibly easy to care for the clothing items that remained. Laundry has been an issue for me throughout my life and for the last month, I’ve kept it completely tidy and it has been wonderful. It made me wonder how much time I was giving to things which I didn’t even want in the first place? Essentially, there were shirts I was wearing only because I had worn all of the other shirts I liked and hadn’t washed yet. Marie’s philosophy changed how I felt about it completely, for the better. 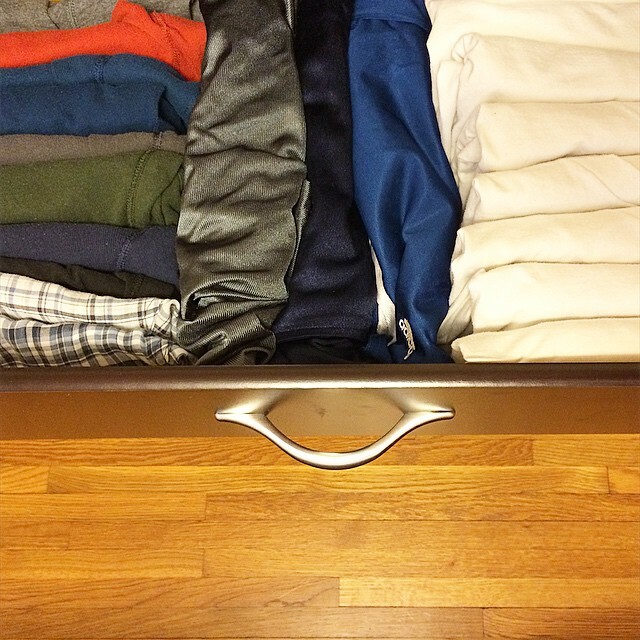 There are other tips included, specifically with clothing as well, such as store your clothing vertically in drawers instead of stacking them on top of each other. That way, you can see all of them and the shirts on the bottom don’t get squished by the weight of the ones on top of them. Here’s an example (a picture I took of my drawer after converting it to the method suggested by the book). Overall, I’d highly recommend the book as a way to continue efforts towards decluttering or if looking for a system to begin the process. Marie has a quirky yet charming approach to the things that surround us in our lives, be it our homes themselves or the socks on our feet. If you’re interested, you can purchase the book here. It’s a quick and worthwhile read. I know I am sentimental about tshirts and also have a ‘but what if I need / want it someday ‘ complex about work shirts. Once I see what I really reach for this winter I plan to thin out my closet. I haven’t gone full kondo, but the book gave me a lot to consider. I enjoyed Peter Walsh’s ‘it’s all too much’. It looks to me like your clothes are now squished horizontally instead of vertically. When I fold my t-shirts (all other shirts are hung up), I stack them vertically. I can fold them fewer times than the method demonstrated by Kondo and therefore they have fewer creases. I don’t have many so they don’t take up much drawer space. Hey Buddy!, I found this information for you: "Book Review: The Life-Changing Magic of Tidying Up: The Japanese Art of Decluttering and Organizing". Here is the website link: https://www.breakthetwitch.com/book-review-life-changing-magic-tidying-japanese-art-decluttering-organizing/. Thank you.